Society is Brainwashed is the B Side to the first 12" single from the new Ill Bill album, The Hour of reprisal which drops on the 16 of September. The A Side is called I'm a Goon and is pretty dope but its the B Side that wins out on this piece of vinyl. Its a dark Premier produced banger that shows us that 2008 belongs to Premier. 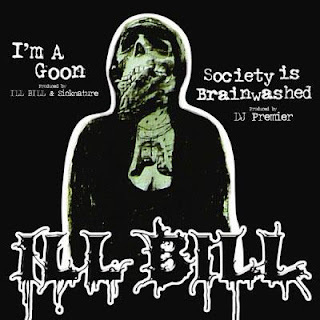 Ill Bill drops his usual drug stained conspiracy rhymes with ample skill over the Premier beat that sounds full of suspense and has some dope scratches and gunshots throughout. This track has me hyped for the album and I for one will be picking the album up when it drops. Non Phixion were dope and Bill has yet to disappoint. The album will feature production from Premier, Necro, Muggs and Moss among others. Bill has also managed to recruit some dope underground lyricists too; Raekwon, Vinnie Paz, Immortal Technique, B Real, Tech N9ne, Necro and Everlast. In addition to these guys theres alaso a rock element to the album with appearances from Howard Jones of Killswitch Engage, Max Calvera and Darryl Jenifer of Bad Brains.